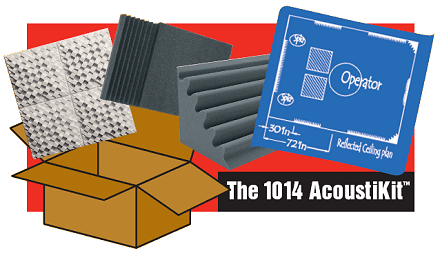 The 1014 AcoustiKit™ is specifically designed to provide the necessary acoustical treatments for a studio control room or a critical listening environment with dimensions up to 10’ wide by 14’ deep. This package contains 48 pieces of 1’x1’ Cutting Wedge® studio foam to treat the front wall and the first reflection points on the ceiling and side walls. The 1’x1’ dense blade design allows you to create an anechoic parquet pattern or an aesthetic personally tailored to your preference. The Bermuda Triangle Trap® provides broadband absorption and prevents bass build up in the rear corners. This is the only kit to include the patented Model F Art Diffusors®. These professionally designed binary array sound diffusors scatter the sound and aid in creating a space that sounds larger than it is. A room design guide is provided with your order and is available on line @ http://www.acousticsfirst.com/1014-acoustikit.htm.